Flames and smoke are seen billowing from the roof at Notre-Dame Cathedral, as the first images of inside the building. 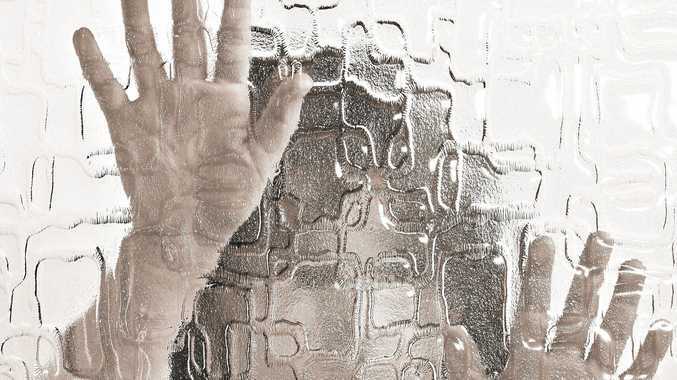 Picture: Veronique de Viguerie/Getty Images. As the smoke contines to circle around the iconic Notre Dame Cathedral in the heart of Paris, the first photos of the damage inside the 850-year-old landmark have been released. Notre Dame went up in flames about 6.50pm local time on Monday night - 2.50am AEST. A spokesman for the cathedral told local media the fire alarm went off almost immediately. Smoke could be seen coming from the building's attic and pictures and video of the fire were being shared around the world on social media within minutes. 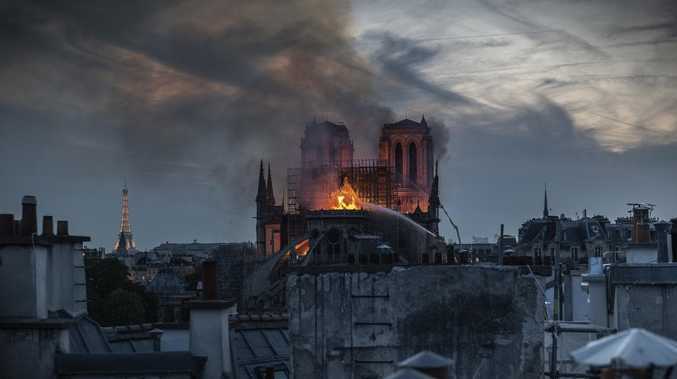 Paris Fire Department commander general Jean-Claude Gallet said the cathedral's main structure had been saved after hours of work by firefighters on the scene, but flames had caused significant damage both inside and outside the structure. The first images of the destruction inside the burning cathedral show smoke filling the entrance and smouldering rubble blanketing the floor. 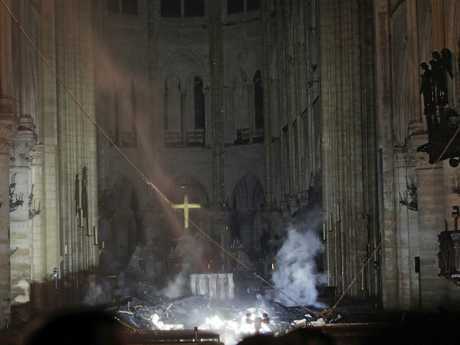 The Nave (main seated chamber inside the cathedral) is littered with piles of debris, as light beams through the cross at the alter. "I'm telling you all tonight - we will rebuild this cathedral together," Mr Macron said. "This is probably part of the French destiny. "And we will do it in the next years. Starting tomorrow, a national donation scheme will be started that will extend beyond our borders." 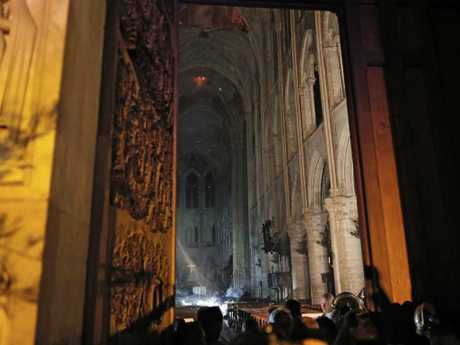 Inside the smouldering entrance of the Notre Dame Cathedral. Picture: Philippe Wojazer/Pool via AP. There were initial fears that one of the world's most priceless relics - Jesus Christ's Crown of Thorns - might be lost in the fire. However, the Mayor of Paris Anne Hidalgo announced that the architectural treasure, along with a number of other items, had been saved. "The crown of thorns, the tunic of Saint Louis and several other major works are now in a safe place," the tweet read. 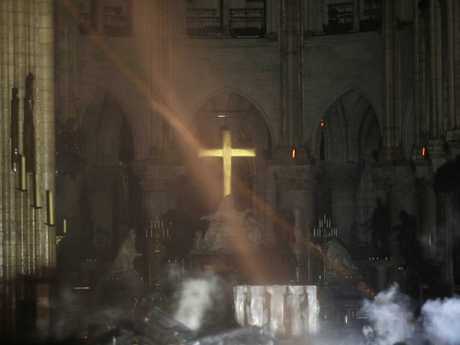 It is understood Parisian firefighters put their lives on the line to save the priceless relics, forming a human chain inside the burning Notre Dame to salvage Jesus Christ's Crown of Thorns. The cathedral is one of France's most popular tourist attractions, second to the Eiffel Tower, and draws about 13 million tourists each year.